I did not expect that giving a lecture can also earn me another certificate. 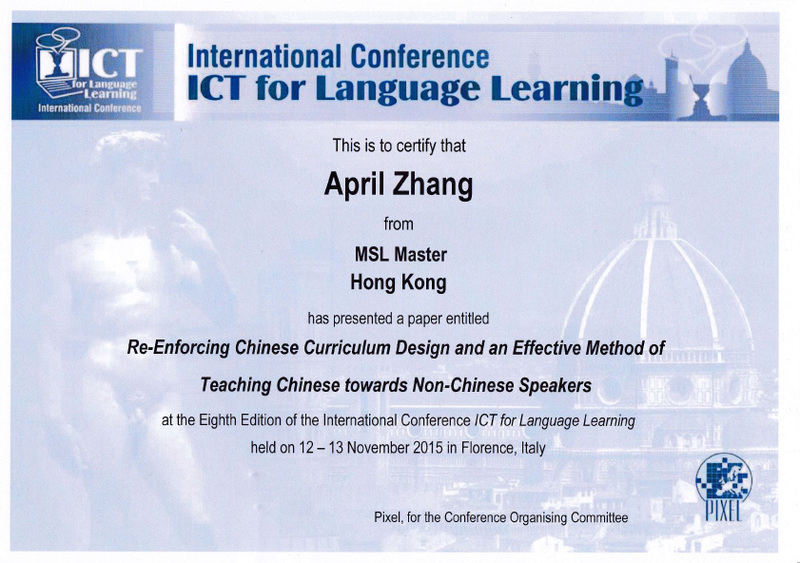 A certificate I earned indeed at this trip to Florence Italy, for the International Conference ICT for Language Learning, November 2015. It was really nice to go to a conference in a historical city, such as Florence. I have to say that it is Florence that gave me extra incentive to deliver the paper. The paper, titled Re-Enforcing Chinese Curriculum Design and an Effective Method of Teaching Chinese towards Non-Chinese Speakers, was received well by the small yet active audience. Judging from the paper topics, it is clear that learning and teaching Chinese is still not wide spread in Europe, where so many different languages are competing with one another already. Nevertheless, this is such a rewarding trip! For the first time, I got to emerge myself, body and soul, in the paintings, the architectures, and the food! April Zhang, the owner of MSL Master, an education solution company specialised in Mandarin as a Second Language.